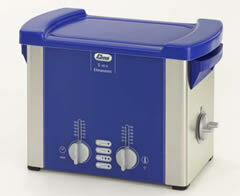 Ultrasonic baths can be used in cleaning, de-gassing and sonochemistry applications. Ideal for cleaning components where handling may damage delicate parts, ultrasonic cleaning baths are widely used by medical, dentistry, electronic and optical industries. Ultrasonic Cleaning is a safe and efficient modern procedure which ensures perfect cleaning within the shortest time possible. It has many advantages over ordinary cleaning methods. Ultrasonic Cleaners can remove even the most tenacious deposits from parts which would be difficult to reach by hand, it also reduces the risk of injury or infection which may occur during manual cleaning. Ultrasonic cleaning systems combine the power of ultrasound (sonic wave) and cleaning solution to wash and sanitize delicate or tough-to-clean parts. The size of your cleaning system can vary depending on your needs. Sometimes a small table top cleaner will be sufficient, while for other users, a multi tank industrial system may need to be assembled. 1. Laboratory :- For Glassware, Filter, Cleaning and HPLC Mobile, Phase Degassing. 2. Industrial :- Printed Circuit Boards, Semi-Conductors, Electron Precious Parts and Mechanisms Components. 3. Medical :- Dental and Surgical Instruments. 4. Optical :- Spectacles, Spectacle Frames, Lenses. 5. Jewellery :- For all kinds of Jewelleries, Precious Stones etc. 6. To Remove :- Dust, Oils, Greases, Polishing Compound, Waxes, Swarf, Stains, Soils and any other Contaminants. 1. Easy to operates & maintain with one piece S.S. Tank. 2. Indigenously manufactured with advanced MOSFET technology with Auto-tuning facility. 3. Digital Tuning of Transducers with Generators to avoid any frequency shifted even during demanding applications. 4. Compact, rugged and highly durable systems. 5. Extensively protected electronic circuits means longer and safer Operations.